According to the 2016 McQuaig Global Talent Recruitment Survey, nearly two-thirds of respondents say it’s hard to find a cultural fit when hiring. And when there isn’t a good fit, we often end up losing people fairly quickly, and that’s expensive and inefficient. So, given what’s at stake here, why are we finding it so hard to align who we’re hiring with what our culture truly is? In short, because the hiring process is fundamentally dishonest. I don’t mean recruiters and candidates are lying outright (though that does happen too). I mean that the entire system is built on the premise that neither side in the process is going to be speaking the whole truth. 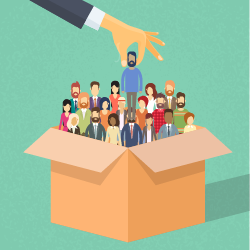 44 low-cost (and free) ideas to reduce chamber employee turnover. On the employee side, candidates obviously want the job, so it is in their interest to present a picture of themselves that best matches what the employer wants to see. The truth is, they are not presenting the picture that reflects their own greatest strengths, potential, or aspirations in an authentic way – Instead, they are telling the employer what they want to hear. It is in their interest to do so. And on the employer side, organizations are in the middle of a “war” for talent, so we’re not about to tell the whole truth of what it’s like to work here. We’ll stress how great our culture is, and share our cool core values (Integrity! Excellence! Fun! Work-life-balance!). To get the best talent to say yes, we’re going to present an attractive picture, even if that means not sharing the whole truth of what it’s really like here. It is in our interest to do so. It is in all of our interests to NOT speak the truth. Hmmm, and we’re finding culture fit hard to do? Imagine that. On the employee side, organizations have been making efforts. There are more holistic assessments of candidates to get a more complete picture – for example, several of the companies we found in our research are including short-term work assignments as part of their interviewing process. There’s a lot more to assess when watching people getting their hand dirty trying out doing the job and interacting with others, compared to just asking them questions about doing the job. But what’s happening on the employer side? Why are we not working harder to present a more holistic and authentic picture of what it’s like to work at our organizations? The candidates should be able to see that information, just like we employers want to see the whole picture of who they are. The only way you get true culture fit is if the honest picture is painted on both sides of the equation. But here’s the rub. Most employers don’t even know what their culture is. They know what their recruiting and marketing collateral SAYS their culture is, and they know about all of their efforts to create a culture that the business literature says you SHOULD have, but they don’t know what it’s really like to work there. They don’t know the actual genetic code that determines what employees will, in fact, experience when they work there. Let’s say you discover that you are a fairly hierarchical place. You may think that you should perhaps hide that trait in your hiring process, given today’s “culture cool kids” emphasis on flattening hierarchies and the growth of emerging systems of self-management, like Holacracy. But here’s the catch: what if the way you emphasize hierarchy actually drives your success in your unique environment? If you got clear on that, you’d be smart to advertise the hierarchical nature of your culture. Because then you could attract the people want that, people who know they will thrive in that environment. Suddenly you’re hiring people who naturally connect to what you already know drives your success. That’s cultural fit. But it starts with knowing what is and then connecting that to what drives your success – two steps that most organizations today are ignoring. The ones who figure this out are winning the war for talent. Maddie Grant is the author of Humanize and When Millennials Take Over, and is Founding Partner at WorkXO, a culture startup that helps forward-thinking leaders in growth-oriented organizations use culture analytics to tackle business problems. Attract the right talent, increase engagement, and more through the Workplace Genome™ Project – learn more at www.workxo.com.